Fresh off his first season as a licensed trainer, Dermot Magner has had the opportunity to do what many aspiring racing professionals can only dream of in this country, and that is to apprentice under two of the nation’s leading trainers. Since his arrival in the U.S. in 2012, the 39-year-old Irish horseman has done just that, serving as a foreman for seven-time Eclipse Award winner Todd Pletcher before becoming an assistant for the powerhouse operation of Chad Brown, who himself garnered Eclipse titles over the past three seasons. However, prior to that dream run, Magner developed the foundation of horsemanship in his own backyard, Rathkeale in Co. Limerick, Ireland. Bitten by the bug early, Magner’s passion for horses included a variety of disciplines, including point to point, steeplechase, in addition to a steady stream of buying and selling horses. In Saturday’s opener at Aqueduct, Magner notched the fifth win of his young career when Win the Shake (Shakin It Up) captured a maiden special weight event by 4 3/4 lengths. Among his early stops in racing, Magner worked for renowned Irish horseman Frank Berry at The Curragh before a stint with top steeplechase trainer Michael Hourigan. Casting an eye beyond the Irish borders, Magner ventured to England for a short spell with one of Europe’s most recognizable conditioners, John Gosden. 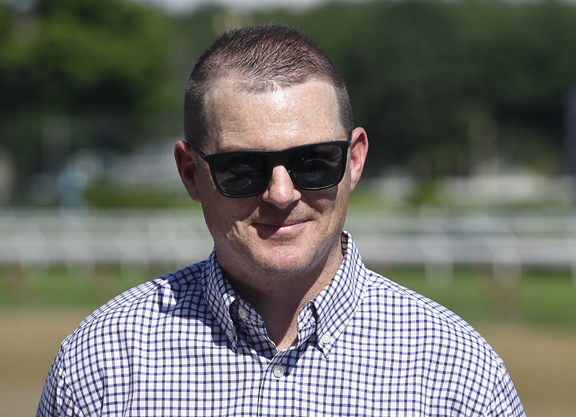 Following that heady ride, Magner decided to make the jump to the U.S. and joined Godolphin’s string–charged with developing the operation’s young stock–in Aiken, South Carolina. It was during his time in Aiken that he made the acquaintance of longtime Maktoum family-trainer Kiaran McLaughlin, a former assistant to Hall of Fame trainer D. Wayne Lukas. Unable to take on the Irish import himself at that particular juncture, McLaughlin directed Magner to another former Lukas assistant, Todd Pletcher. 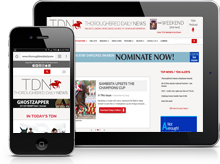 A host of equine stars ascended to the highest level during Magner’s tenure with Team TAP, including GI Belmont S. champ Palace Malice (Curlin), GI Kentucky Oaks heroine Princess of Sylmar (Majestic Warrior), GI Breeders’ Cup Distaff winner Stopchargingmaria (Tale of the Cat), GI Wood Memorial and GI Haskell scorer Verrazano (More Than Ready) and Competitive Edge (Super Saver), victorious in the GI Hopeful S.
After spending a trio of Saratoga summer meetings with the prolific operation, Magner decided to take his own experience to the next level and landed a position overseeing Chad Brown’s Monmouth division for the next two seasons. Taking the next logical step to the training ranks early last year, Magner recorded his first victory with Hersh (Jimmy Creed) last August. Currently, the Irishman has 10 head at Palm Meadows and another 12 at Belmont Park in New York and he is hopeful he can make some noise in 2019. Among his barn’s notables is Jacob Schnoor Jr’s Strong One (Dialed In), a runaway winner at Gulfstream Jan. 2. Magner is also high on Newtown Anner Stud’s She Takes Charge (Take Charge Indy), an impressive winner in her career debut at Aqueduct Dec. 23 before finishing third at that venue Jan. 26; unraced Safta (Dialed In), a $150,000 juvenile purchase at OBS last season; and Lutsky (Yes It’s True), campaigned by Down Neck Stables and Jeffrey Lutsky, a first-out winner for Jason Servis before joining Magner. Already off to a solid start with a pair of victories under his belt early in the new year, Magner plans to build off that momentum through the ensuing season. While the search for that singular horse ensues, the saying ‘the best indicator of the future is what’s been done in the past’ appears to sum up what’s next for Magner. “I always had a horse at the end of a chain,” acknowledged Magner. And that doesn’t appear to be changing any time soon.